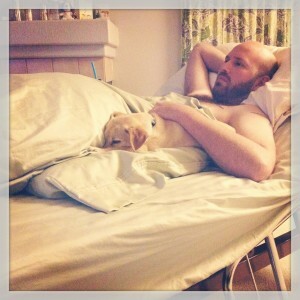 This is a continuation of Mike’s cancer story. Read parts 1 and 2 here and here. Mike and our dog, Jetty, relaxing on his hospital bed. On January 14, after 27 days in the hospital, Michael was finally released to go home. We had a hospital bed set up in our living room at home for him to watch TV. Once his back started healing, he was able to lay on it as well as his left side, to give the right side of his body some relief. He had been laying on his right side exclusively since the surgery a month before. We were both extremely happy to be home! Michael starting seeing a physical therapist to start building up his strength again. His left arm and neck were affected by all of the muscle removed in surgery, but the rest of his body was weak, too from all of the time spent in bed in the hospital. He progressed quickly though and was ready to get back to normal. We had lots of friends and family come by to visit and cheer us up. Unfortunately, the doctors were not able to remove as wide a margin around the cancer as they would have liked. It was decided that although radiation treatment was what caused this cancer, Mike would have to undergo radiation treatment again. If he did not, the likelihood of it returning would be greater and the treatment options would be limited. 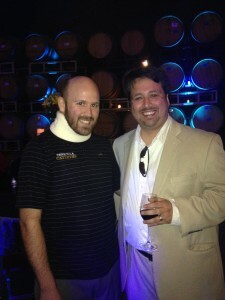 Michael and his brother, Greg at the fundraiser. 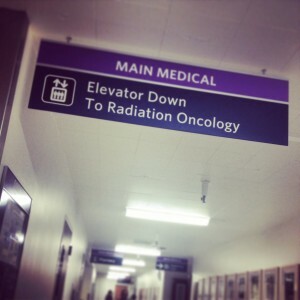 On Mar 6, we went to the hospital for Michael’s first radiation treatment. It was the first day of daily treatments that would continue for the next six weeks. Unfortunately, the machine broke down and he was unable to receive treatment that day. He did receive treatment the next day and we went home for the weekend. That weekend, a local winery we work with hosted a fundraiser party for Mike’s treatment. So many people have helped us get through this time, and we are so grateful! The next six weeks found us following a strange routine: Mondays we would pack up and drive to City of Hope and check in to our room at Hope Village, where we would stay for the week while Mike received his daily radiation treatments. I would stay with Mike Monday through Wednesday, then I would drive home to go to work Thurs-Sun. One of Mike’s parents or one of his aunts usually came to stay with him Thursday and Friday. Unfortunately, the radiation treatment was really tough on Mike. 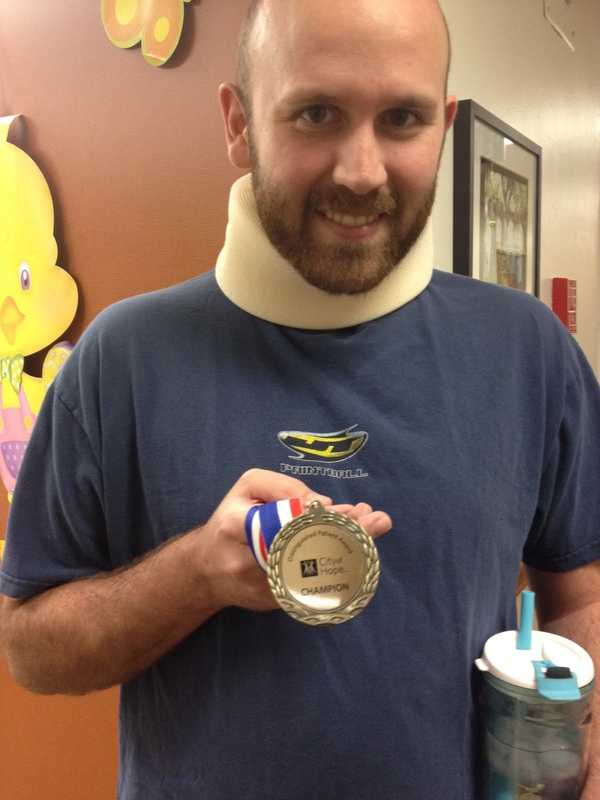 His esophagus and throat became raw and sore, making eating a painful process. His stomach was upset and nauseous a good portion of the time. As a result he lost a lot of weight during treatment. The treatment itself takes 500 calories each time, so in order to just maintain his weight, he would need to ingest 2500 calories a day. Some days we were lucky if we could get him to keep 1500 calories down. He drank a lot of protein shakes during his treatment, since protein was also essential for continued healing. They gave Mike a medal for completing radiation treatment. My hero! April 17th was Mike’s last day of radiation treatment and we were able to go home to stay, finally! Unfortunately during treatment, Mike’s skin graft on his back opened up a lot so the healing he did prior to radiation was reversed somewhat. Now it’s been about 4 weeks since Mike completed treatment and the healing on his back is almost completely done. There is just a small area that is still open, but otherwise looks great. We are on the tail end of this thing and we couldn’t be happier. I am so grateful to all the doctors, nurses, PCAs and other staff that helped us during Mike’s treatment. It was so incredibly difficult, but we tried to take it just one day at a time and we got through it. Mike has started driving again and we’re both looking forward to getting back to the things we love doing!